Have you met the vintage jewelry store online? A one stop shop for all jewelries. This is an online elegant vintage jewelry shop. That includes engagement rings, antique jewelry, estate jewelry and fine jewels of many other kinds including vintage brooches, vintage style pendants and many more choices. One of the their highlights is the vintage style rings , I picked up one style here as you can see a Vintage 14k Gold and Diamond Ring with Baroque Pearl , really nice right? Cool and elegant. Crown your fingers with prefect and real gold karat via Vintage yard. This shop introduce men’s jewelry, bracelets, earrings, pendants and most specially rings. I remember when me and my hubby rush to look for wedding ring before our wedding day. We checked on different ring shops and till we find one suitable for our fingers and of course the one we both like. That was good to canvass but that time we are in a hurry. 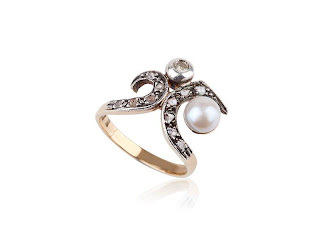 So for those who are looking for different styles of rings , check out this site for you to have good ideas on new updated ring designs and take a look at their vintage pendants , to complete your shopping galore. Prices starts at $99 and up. It depends on the karat, style and stone with-in your ring choice. They have the combination of two tone from silver to gold. The fashion for rings now is the two tone style. Our wedding ring is composed of two tone and it looks very elegant and simple. I really like it… Rings symbolizes the best memory from the person who gave you. It must be kept and treasured. For more vintage rings, just visit their website online at http://www.vintageyard.com. If you are living somewhere in U.S, enjoy their FREE shipping cost from your orders. For international, enjoy their lowest fees charge. This entry was posted on 5:19 AM and is filed under Blogging , Vintage pendants , Vintage style rings . You can follow any responses to this entry through the RSS 2.0 feed. You can leave a response, or trackback from your own site.